"The storms of the world can be scary and the winds can push a weak person here or there but she stands strong and unafraid. She is illuminated by a light from above. You can not see the source but you can see the effect that it has on her - how it brightens her compared to her surroundings. 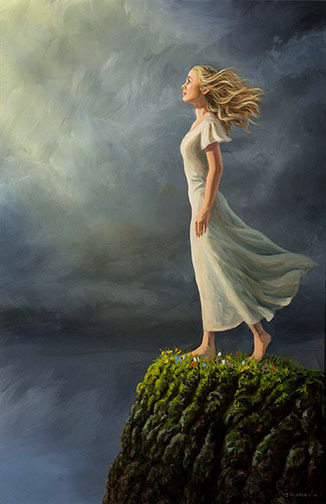 She is hopeful, standing on a firm foundation and looks to the heavens. She is focused on her goal. Around her feet are beautiful things. She didn't go to this location because it was beautiful. She brings beauty where she goes (notice how the rock is barren and in shadow but becomes more alive as it gets closer to her). It's all about how one person can make a difference in the world. How being an example can light the world - how a little bit of beauty can bring happiness and hope to many." The Art of James H. Fullmer Jay Fullmer: A collection of paintings and other works of art.